Screening – The first step in purifying surface water is to remove large debris such as sticks, leaves, rubbish and other large particles which may interfere with subsequent purification steps. Most deep groundwater does not need screening before other purification steps. Pure water has a pH close to 7 (neither alkaline nor acidic). Sea water can have pH values that range from 7.5 to 8.4 (moderately alkaline). Fresh water can have widely ranging pH values depending on the geology of the drainage basin or aquifer and the influence of contaminant inputs (acid rain for example). If the water is acidic (lower than 7), lime, soda ash, or sodium hydroxide can be added to raise the pH during water purification processes. Lime addition increases the calcium ion concentration, thus raising the water hardness. For highly acidic waters, forced draft degasifiers can be an effective way to raise the pH, by stripping dissolved carbon dioxide from the water. Making the water alkaline helps coagulation and flocculation processes work effectively and also helps to minimize the risk of lead being dissolved from lead pipes and from lead solder in pipe fittings. Sufficient alkalinity also reduces the corrosiveness of water to iron pipes. Acid (carbonic acid, hydrochloric acid or sulfuric acid) may be added to alkaline waters in some circumstances to lower the pH. Alkaline water (above pH 7.0) does not necessarily mean that lead or copper from the plumbing system will not be dissolved into the water. The ability of water to precipitate calcium carbonate to protect metal surfaces and reduce the likelihood of toxic metals being dissolved in water is a function of pH, mineral content, temperature, alkalinity and calcium concentration. One of the first steps in a conventional water purification process is the addition of chemicals to assist in the removal of particles suspended in water. Particles can be inorganic such as clay and silt or organic such as algae, bacteria, viruses, protozoa and natural organic matter. Inorganic and organic particles contribute to the turbidity and colour of water. The addition of inorganic coagulants such as aluminum sulfate (or alum) or iron (III) salts such as iron(III) chloride cause several simultaneous chemical and physical interactions on and among the particles. Within seconds, negative charges on the particles are neutralized by inorganic coagulants. Also within seconds, metal hydroxide precipitates of the aluminum and iron (III) ions begin to form. These precipitates combine into larger particles under natural processes such as Brownian motion and through induced mixing which is sometimes referred to as flocculation. The term most often used for the amorphous metal hydroxides is “floc.” Large, amorphous aluminum and iron (III) hydroxides adsorb and enmesh particles in suspension and facilitate the removal of particles by subsequent processes of sedimentation and filtration. Aluminum hydroxides are formed within a fairly narrow pH range, typically: 5.5 to about 7.7. Iron (III) hydroxides can form over a larger pH range including pH levels lower than are effective for alum, typically: 5.0 to 8.5. 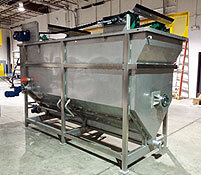 In water purification plants, there is usually a high energy, rapid mix unit process (detention time in seconds) where the coagulant chemicals are added followed by flocculation basins (detention times range from 15 to 45 minutes) where low energy inputs turn large paddles or other gentle mixing devices to enhance the formation of floc. In fact, coagulation and flocculation processes are ongoing once the metal salt coagulants are added. Organic polymers were developed in the 1960s as aids to coagulants and, in some cases, as replacements for the inorganic metal salt coagulants. Synthetic organic polymers are high molecular weight compounds that carry negative, positive or neutral charges. When organic polymers are added to water with particulates, the high molecular weight compounds adsorb onto particle surfaces and through interparticle bridging coalesce with other particles to form floc. When particles to be removed do not settle out of solution easily, Dissolved Air Flotation (DAF) is often used. Water supplies that are particularly vulnerable to unicellular algae blooms and supplies with low turbidity and high colour often employ DAF. After coagulation and flocculation processes, water flows to DAF tanks where air diffusers on the tank bottom create fine bubbles that attach to floc resulting in a floating mass of concentrated floc. The floating floc blanket is removed from the surface and clarified water is withdrawn from the bottom of the DAF tank. To clean the filter, water is passed quickly upward through the filter, opposite the normal direction (called backflushing or backwashing) to remove embedded particles. Prior to this step, compressed air may be blown up through the bottom of the filter to break up the compacted filter media to aid the backwashing process; this is known as air scouring. This contaminated water can be disposed of, along with the sludge from the sedimentation basin, or it can be recycled by mixing with the raw water entering the plant although this is often considered poor practice since it re-introduces an elevated concentration of bacteria into the raw water. 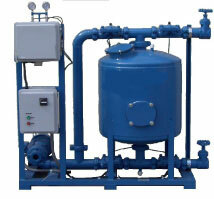 Some water treatment plants employ pressure filters. These work on the same principle as rapid gravity filters, differing in that the filter medium is enclosed in a steel vessel and the water is forced through it under pressure. Chlorine dioxide is a faster-acting disinfectant than elemental chlorine. It is relatively rarely used, because in some circumstances it may create excessive amounts of chlorite, which is a by-product regulated to low allowable levels in the United States. Chlorine dioxide is supplied as an aqueous solution and added to water to avoid gas handling problems. This article uses material from the Wikipedia article “Water purification”, which is released under the Creative Commons Attribution-Share-Alike License 3.0.